Most students are in some way interested in comic art. Introducing them to artist, Roy Lichtenstein is a good way to bridge students over to the world of fine art. 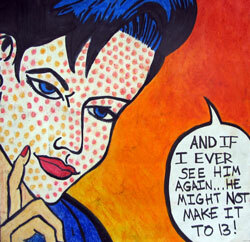 Why not have students create their own Lichtenstein images from comics that you may have lying around. If you can stand cutting them up. Overview and Purpose: To expose students to Principles of art, Unity and Harmony. To expose students to Pop artist Roy Lichtenstein and to familiarize students with the use of oil pastels. Objectives: Students will learn the principles of art, Unity and Harmony. They will learn how they work together to create a successful work of art. Students will be exposed to Pop artist, Roy Lichtenstein and his use of comic art as a source for Pop art. Delivery of info: Students will be presented with the concepts of Harmony and Unity and receive examples of Lichtenstein’s work. Students will be told the step by step process of creating their own Lichtenstein Pics. Teacher will cut up comic pages into single frames. Older comics work better because the dots from printing are present. Students will select one comic frame to complete a full image from. Students will transfer the small comic image to a proportional sheet of drawing paper. Students will use markers and oil pastels to finish the drawing in the style of Roy Lichtenstein. Guided Practice: Students will work while the teacher walks around and evaluates and offers helpful suggestions. Students will have 5 days total for the assignment.